We were fortunate to attend the Washington Post Live event that was part of the GE American Competitiveness: What Works summit at the Andrew Mellon Auditorium earlier this week. 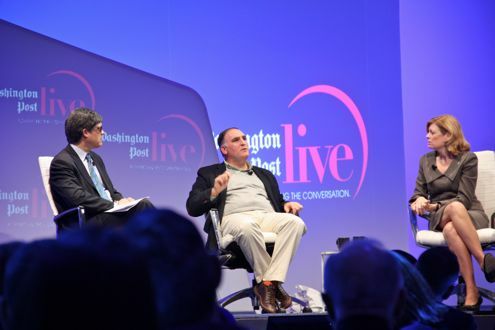 For the luncheon keynote, Mary Jordan of the Washington Post moderated a discussion between local celebrity chef Jose Andres and Tom Sietsema, the Post’s infamous food critic. Disguised with a toupee and sunglasses, we’re sure Andres was a little uncomfortable sitting inches from the man who can easily make or break a restaurant in D.C.
We won’t go into too much detail about the event since you can read more about it here and here, but we’ll say that Jose Andres is definitely a captivating and engaging speaker. He truly has some inspiring ideas and cares about his adopted home of D.C., the obesity epidemic, food truck regulations, and of course, his beloved Spain. The session opened with a video of someone caramelizing olive oil, something that has never been done before, in addition to a “Garden on a Plate”, aka the prettiest salad anyone has ever seen. He then explained that it was an homage to Dale Chihuli. Jose knew he wanted to be a chef since he was 15 years old. Talking about tapas, Jose explained that the concept took time for Washingtonians to get used to because you have to think differently. For those still wary of tapas and the idea of sharing, he suggests the rule of 15 inches. If you want to enjoy tapas the Spanish way, put the plate in the middle of the table. If you don’t, move the plate 15 inches in, and put it in front of you. 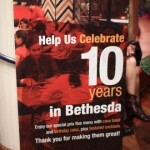 This was the difference between success and failure for the restaurant. Andres confirmed that his new food truck, Pepe, will be opening next week. Some would say he should be against food trucks since it takes away from his restaurants; he wants to embrace the new trend and feels it drives innovation and creates jobs. 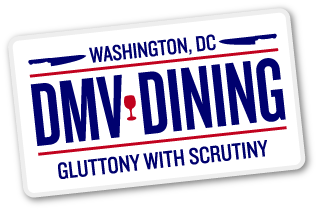 But, cities need to come up with the right legislation for food trucks to not alienate or discourage them from opening. When Jaleo first opened downtown 20 years ago, his first guest was Senator Daniel Patrick Moynihan. 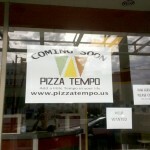 It will be closing for a few weeks soon to allow for renovations and a refresh of the oldest ThinkFoodGroup restaurant. The idea behind America Eats Tavern: Every restaurant needs a story. He wanted to open the pop-up restaurant as a way to give back to America and to show America’s real culinary history. Some may criticize Andres that, because he has so many restaurants, there is no way he can possibly spend time in all of them and therefore the quality goes down. He said it’s not like the CEO of GM is overseeing every car, but he understands with food it is more personal. However, he claimed he has people working for him now that are more talented than him, so it is a win/win. For the last 2-3 years, members of his team have been teaching at Harvard’s School of Physics, showing the science of physics through food. They have had over 1,000 applicants to the class so far. He has many ideas on ways to fight obesity by showing the importance of food. Innovation over the last 60 years has made us used to mainly processed food. We need to bring more grains, fruit and vegetables, less quantity but higher quality of meat to all families. Rural America should be empowered to bring more natural, less processed food to the table of America. When asked what was the coolest thing done he has done with potatoes, he replied he turned them into air, but people didn’t get it. At ThinkFoodGroup they are working towards understanding food as an artistic expression. For example, one of the newer creations that will be on the menu at the revamped Minibar will be a potato chip you don’t eat, but listen to. Obviously, you don’t want to feed America with the sound of chips, but they can be a course on a menu as a way to think differently. At Jaleo in Las Vegas, they were selling their coquettes in designer Spanish sneakers. Eventually they had to stop because of health-code violations, but the concept of serving the dish in a glass sneaker will be brought to D.C. when Jaleo reopens downtown. As Andres explained, serving food on a flat table with white plates is boring. He wants to make sure the culinary experience is enjoyable. As a member of the board, Andres thinks DC Central Kitchen is the most innovative organization, and that it is amazing to see that through feeding people, there is the power to innovate. 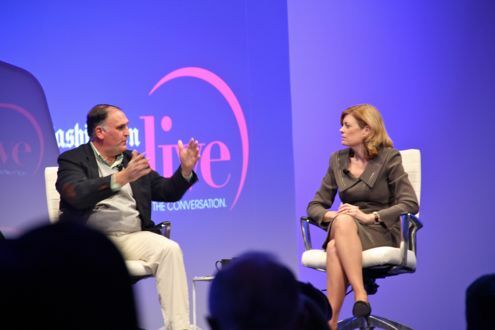 If Jose Andres was not a chef, he would be an idea man. His newest idea is a way to boost the economy and awareness of Spain. He envisions opening a school to train Americans in Spanish cooking as a 13-weeks program, and then have them travel to Spain. From there, they can open their own Spanish restaurant, or at use Spanish products in their cooking. In his mind, a simple idea can create thousands of jobs.